Sorry for the delay between entries, but work has been very busy of late. 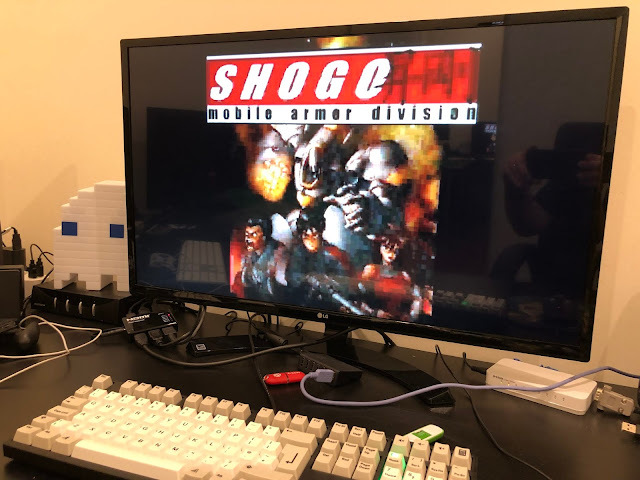 Today I am starting a multi-part blog post following the installation of a CF Card with AmigaOS on the Amiga 600. For those following along my blog previously you would know that I already put a IDE HD running AmigaOS3.9 on my Amiga 600. However, I did cheat a bit - I had already prepped that hard disk on an Amiga 1200 previously, and then adapted it to work on the Amiga 600. This was so I could quickly check everything with my expansions worked as I wanted it to. But now, I need to do it properly from scratch, using a CF Card to to IDE converted Hard Disk, purchased from AmigaKit. You can buy it from here. It is a 4GB CF card, already prepped for Amiga use, running Fast File System (FFS). Here is some photos of the CF to IDE converter card and cable. I opted for the longer two connector version of the IDE cable, which allows me to add another IDE device later. You can see above that the ACA630 and A604n expansion previous installed in my Amiga 600 here and here. These are giving me the 68030 accelerator, 2MB Chip RAM and 34MB Fast Memory, amongst other things! Clearly the AmigaKit AmigaOS installation program does not copy the Installer program from the Install Disk, part of AmigaOS3.1. Now I can run the installer, and get IDE-Fix 97 installed. This is needed to provide the large partition size support (over 4GB). I then copied my registered whdload key file to the s: location. 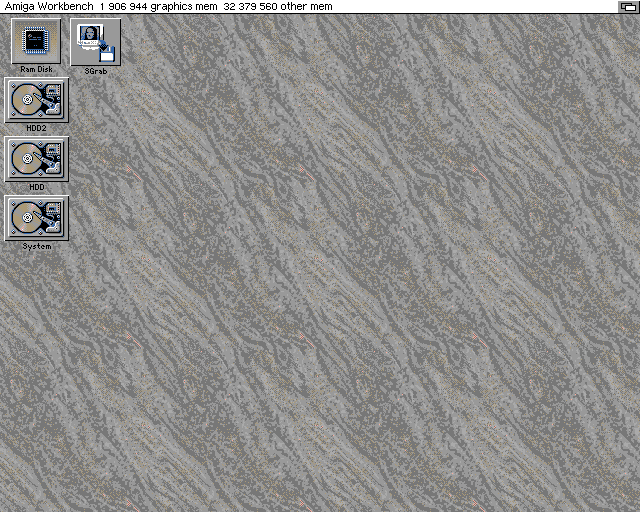 Having got this far and having a working AmigaOS3.1 install on the Amiga 600, I also installed sgrab from Aminet so I could start taking screenshots of the installation work instead of having to use a camera to do it! After the reboot, here is the AmigaOS3.1 workbench on the Amiga 600 - long way still to go on the setup! Before I rebooted I also installed the fat95 archive which was extracted to RAM: as part of the Poseidon installation. 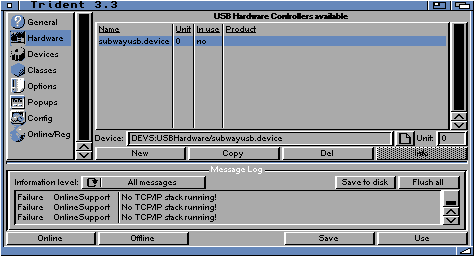 Make sure you install this, otherwise you can't read the FAT formatted USB flash drives! 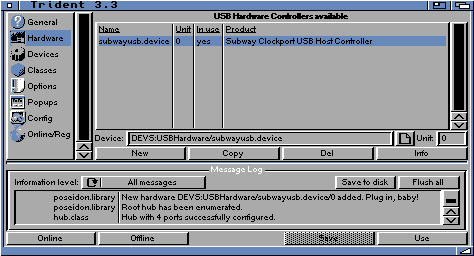 Next, after the reboot I needed to copy the updated subwayusb.device driver from Individual Computers to the DEVS:USBHardware location, so that Poseidon can find the Subway USB device. I did this via floppy disk. Hopefully this shows what is needed to get a Classic AmigaOS3.1 setup up and running from scratch. The AmigaKit supplied pre-configured AmigaOS CF Card with built-in software does make it easier! Still a lot more to do of course, but I will continue work on this in the next part!